When Hitler invaded Poland on September 1, 1939, he felt sure of two things. First, he believed that Germany’s attack on Poland would be swift and successful. Second, he thought Britain and France would not respond to the attack with force. Only one of Hitler’s assumptions proved correct. The attack was quick and it was a success. German air and armed forces were much more advanced than their Polish counterparts. Poland possessed 600 tanks to Germany’s 3,200. Unlike the Germans, the Poles still had cavalry as part of their army divisions. In the early morning of September 1, German aircraft bombed Warsaw. Meanwhile, the German army invaded Poland from the north and south. During multiple air raids, the Germans targeted railroads, roads, and Polish troops. Villages were also bombed in order to terrify civilians. 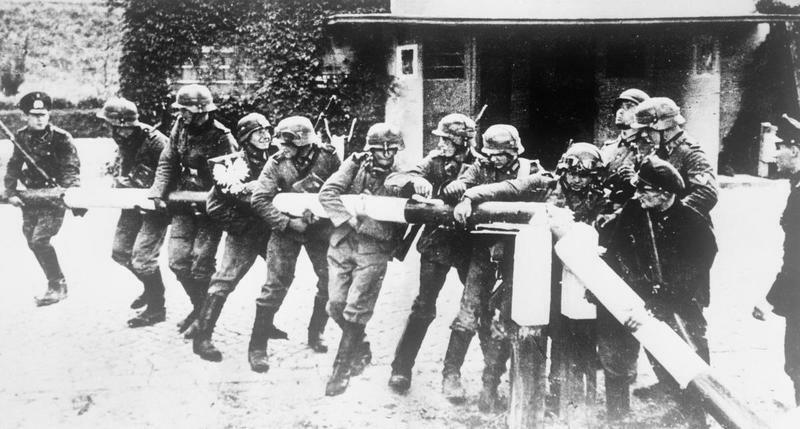 Hitler wanted the civilians to attempt to escape and thus block Polish reinforcements from using the remaining roads. Though he successfully conquered Poland a few weeks later, Hitler miscalculated British and French attitudes to his takeover. He knew that Britain and France had agreed to aid Poland in the spring of 1939 if she came under attack. Still, Hitler wasn’t very worried about a military response from either country. To avoid war with Germany in previous years, Britain and France had already granted Hitler’s demands for German rearmament. They also allowed him to make Austria and Czechoslovakia part of the Third Reich. He thought a takeover of Poland would be followed by more peace talks, not war. Yet leaders in Britain and France had already concluded that Hitler’s demands might never end unless they threatened war. On the evening of September 1, Poland asked Britain and France to honor their promise to defend Poland. That same day, British Prime Minster Neville Chamberlain delivered a speech to the House of Commons. He said, “Eighteen months ago in this House I prayed that the responsibility might not fall upon me to ask this country to accept the awful arbitrament of war. I fear that I may not be able to avoid that responsibility.” On September 3rd, Britain’s ambassador to Germany delivered an ultimatum stating that if Germany did not stop its attack on Poland by 11 AM, Britain would go to war with Germany. Germany did not respond, and Britain’s Prime Minster made an announcement on the radio that the country was at war with Germany.